It’s that time of year again, and the great thing about buying presents for writers is that you can give them something that will provide weeks or months of writing pleasure and inspiration without breaking the bank. Here are some suggestions for things your writing friends might like – or if you’re a writer, why not treat yourself? The name says it all, and they really are gorgeous. I’ve been using them for my writing journals for several years now. Great quality unruled paper, beautiful binding, a useful ribbon to mark your place and a handy pocket at the back for bits and pieces. When I was a student I used to have three biros with me in lectures – one red, one blue and one black. I found that breaking the information down into different blocks of colour helped me to organise my thoughts at the time and remember them later, when I came to revise for exams. Now, we have gel pens – my very favourite stationery item of all time. They write like a dream and come in every kind of vibrant colour. I use them for all my writing tasks including, of course, my gorgeous notebooks – this year’s is colour coded blue for dreams, red for dream commentaries, black for waking life and purple for books I’m reading. I’ve tried all sorts of gels over the years, but the brands I keep coming back to are Pentel and Pilot. Whatever kind of writing you do, it helps to understand what’s most important to you and create writing goals that fit with your core values. That way, you’re both more likely to succeed and also more likely to enjoy your success when you do. My friend Penny Dolan recommended this book to me some years ago, and I’ve recommended it to other writer friends ever since. Even in these days of mobile phones, most writers like to carry a notebook somewhere about their person when they’re away from home, and these are perfect – not too big, bulky, or heavy to put in your pocket; soft but not flimsy covers; good quality unlined paper and attractive cover designs. These definitely fit the bill! Not just writers, but everybody in the world can find solace, joy, companionship and inspiration in poems. Poetry is very much a question of personal taste, so it might be a good idea to go for a collection such as Being Human , Being Alive or Staying Alive. 6 A writing workshop – any writing workshop! A place on a writing workshop will please your writer friends or writer self, and it’ll be something to look forward to at the end of the Christmas festivities. Being a writer isn’t just a way you pass your time – it’s a part of the way you are. Developing a practice of writing is a profound kind of self development, and Natalie Goldberg brings a Buddhist sensibility to it which I love. This is a fascinating workbook with loads of writing exercises. Not for everyone, obviously, but I really enjoyed it. Most writers are more excited by experiences than things, so how about a ticket to somewhere that might spark their imagination, such as a guided city walk or visit to a museum? Three companionable books for writers from me, which all include plenty of short creative tasks for you or your writer friends to take refuge in if you need to pace yourselves over the festive period. For getting started, Writing in the House of Dreams; for keeping going, Happy Writing and for having fun with it, Free-range Writing. Have you got any recommendations for Christmas presents for writers? The theme for this year’s Anti Bullying Week is ‘Choose respect.’ I don’t think there’s ever been a time when we’ve needed this message more than we do right now. Respect is the bedrock of a civilised society. We don’t have to like everybody – we may not be able to help disliking some people – but respect is a choice. We can always choose to behave respectfully. Most people have always made that choice because incivility was not seen as socially acceptable, but the social norm is slipping because those at the forefront of public life – politicians and the news media – are no longer modelling respectful behaviour. Leading politicians on both side of the pond are deliberately stirring up and sanctioning the abuse of minorities and the weak for their own ends. Leading news reporters aren’t interested in hearing reasoned argument, but instead choose to bombard interviewees with interruptions and aggressive questioning. This is the culture our children are growing up in, but if we want them to turn away from bullying they need role models – rules are not enough. Bullying isn’t just a problem among children in schools. It’s increasingly a social problem for us all, and the key to tackling it is not just focusing on bullying incidents but nurturing a non-bullying environment by making a positive decision at all times to behave with thoughtfulness, kindness and civility towards other people, irrespective of our differences. I hope the theme for this year’s Anti Bullying Week will be a timely reminder to us all. I’ve chosen the best place to launch my book! Today is the official publication day for my new book, Free-Range Writing: 75 Forays for the Wild Writer’s Soul, and I think I’ve found the perfect place to launch it. All my previous book launches have been nibbles-and-bubbles parties, with a lot of mingling, a spot of reading and somebody lovely raising a toast. I’ve held them in my garden, my local library, the back room of the village pub, an art gallery, the Sterts open air theatre… Every book is different, and so is every launch. When I discovered that the Looe Literary Festival coincided with publication week I really wanted to launch my new book there. It’s a festival that truly celebrates local writing and grass-roots creativity as well as big name authors, and that’s very much the spirit of Free-Range Writing. There are readings from the Looe Writing Group and the Liskeard Poets, whose book launch I attended recently, having been invited to select the poems for their anthology. Alongside talks by famous authors like Lord Owen, Adam Hart-Davis and Dr Susan Blackmore, there are lesser-known writers of fiction and non-fiction. There are panels and discussions on topics as various as fisheries policy and self-publishing. There’s plenty for children as well. I’ve been in the green room at the Cheltenham litfest, mingling with TV stars who’ve written a book and hawk-eyed photographers trying to get photos of them, and felt curiously detached from the whole business. For me, writing is about all of us, ordinary people; we all have something interesting and beautiful to say. Thinking only famous writing is good writing is a mistake, as anyone who has any experience of writing workshops will know. It’s also harmful because it can make us feel discouraged and reluctant to explore our own innate abilities. My new book is about freeing up your thinking, venturing into every area of your writer self and being surprised by what you find. So this book is all about the writing, and I’ll be launching it in a different way, with a free-range writing talk at 12.00 on Sunday 19th November and then a workshop after lunch, at 2 o’clock. I love doing these community workshops, partly because they’re a chance to work with writers of all ages. They’re not just for children, or for adults, or for families – they’re for everyone age 8+. We all have something interesting to say and we so rarely have the chance to write together. (Participants under 18 must be accompanied by an adult). The Looe Literary Festival is a great event in a gorgeous location and it’s the perfect place to hear about Free-Range Writing, so please come along and help me celebrate if you can. I will hope to see you there! I was going on tour with my three books for writers. I opened my well-travelled, old-fashioned suitcase and there they were, just the books, looking bright and colourful against the black satin lining. I felt very proud of them. I had this deeply pleasurable dream a few weeks ago, when I was emailing publications to see if they would like a review copy of my upcoming book, Free-Range Writing: 75 Forays for the Wild Writer’s Soul, and pitching ideas for articles. (I’m happy to report that Mslexia has accepted a copy for review and I’ve placed an article on free-range writing in the Writers’ News Christmas edition). Usually, I have to put my shoulder to the wheel and get on with it, when it comes to promoting new books, but promoting this one feels joyful. I want to shout about it, partly because it’s my first brand new book in two years, and partly because it gives me a sense of completion. They also reflect my own coming-to-writing. First, before I was a writer, I was a dream worker – I learnt to come and go across the borders of my unconscious and work with the stories and images I found in great abundance there. To use Ted Hughes’ analogy, I learnt to fish. There is the inner life, which is the world of final reality, the world of memory, imagination, emotion, intelligence, and natural common sense, and which goes on all the time, consciously or unconsciously, like the heart beat. There is also the thinking process by which we break into that inner life and capture answers and evidence to support the answers out of it. That process of raid, or persuasion, or ambush, or dogged hunting, or surrender, is the kind of thinking we have to learn and if we do not somehow learn it, then our minds lie in us like the fish in the pond of a man who cannot fish. 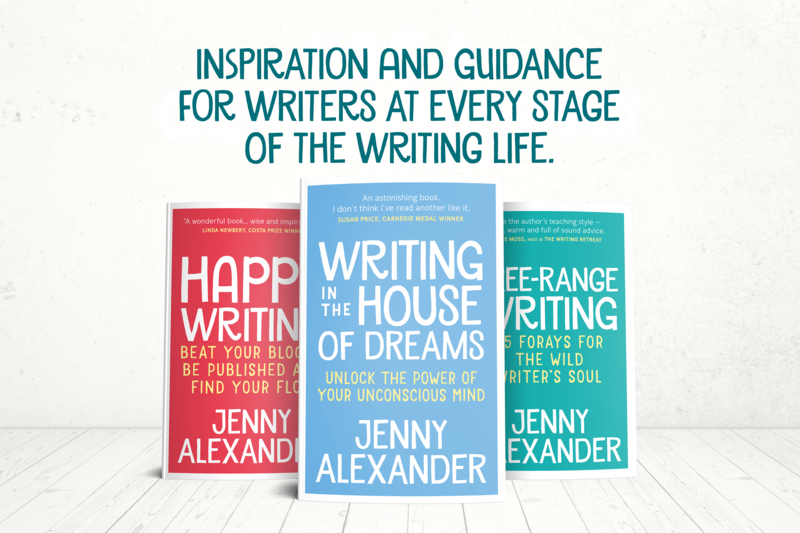 Writing in the House of Dreams it about tapping the mystery of inspiration, the ‘Where did that come from?’ It includes lots of practical writing exercises to help readers open to their own unconscious processes. Next, at the age of 40, I started my writing career. As well as having to build my writing skills, I also had to develop the psychological toughness this business requires: a thick skin, a willingness to be seen, the ability to set clear goals and the flexibility to adapt them. Authors also have to cope with financial uncertainty, and develop other sources of income – many award-winning authors have to fit their writing in around a day job. Happy Writing is about the psychology of writing, the ‘How can I keep going?’, whether in a longer piece like a novel, or over the course of a career. It includes lots of practical writing exercises to help readers build their writing skills, such as plotting and redrafting, identify when hidden fears might be holding them back and create writing goals they can pursue whole-heartedly because they come from their core values rather than other people’s assumptions. In my early 50’s, I began to teach writing workshops, and I always mixed it up, just as I’ve done in my own writing career. I found people were surprised to be asked to write a poem in a plotting workshop, say, or a magazine article in a memoir workshop – they were surprised, also, by how enjoyable and fruitful a more holistic approach can be. Free-Range Writing is about inhabiting more of your writer self and growing as a writer, the ‘Yes, I can do this! What else can I do?’ It includes 75 practical writing forays into different genres, with tips and advice to help readers feel confident about experimenting, and a chapter on how to use these exercises to set up a new writing group or pep up an existing one. Every stage of the writer’s journey is different, and so these three books are all very different from each other. Until I had the dream and actually saw them in my dear old suitcase, all together, they had felt a bit random and disparate. I hadn’t realised that they were a series, each one a necessary part of the whole. I’m not sure I realised, either, that I do feel very proud them, these beloved children of my other lives, in dreams and writing. If you would like to help them make their way in the world, please share this post to your fb/twitter/personal blog. It’s that time again, and the great thing about buying things for writers is that you can give them something that will provide weeks or months of writing pleasure and inspiration without breaking the bank. The name says it all, and they really are gorgeous. I’ve been using them for my writing journals for several years now, as readers of my newsletter will know. Great quality paper, beautiful binding, a useful ribbon to mark your place and a handy pocket at the back for bits and pieces. They write just like a fountain pen but the ink doesn’t smudge, and they come in every colour. If you aren’t keen on sharpies for book-signing, these are a good alternative, as well as being excellent for writing in your gorgeous notebook, of course. Whatever kind of writing you do, it helps to understand what’s most important to you and create writing goals that fit with your core values. That way, you’re both more likely to succeed and also more likely to enjoy your success when you do. My friend Penny Dolan recommended this book to me a while ago, and I’ve recommended it to other writer friends ever since. I got mine from Waterstones. Speaking of Jackie Kay’s workshop, which was pure delight, a place on a writing workshop will please your writer friends or writer self, and it’ll be something to look forward to at the end of the Christmas festivities. Most writers are more excited by experiences than things, so how about a ticket to somewhere that might spark their imagination, such as the Foundling Museum? Two companionable books for writers from me, which both offer plenty of short writing tasks for you or your writer friends to take refuge in if you need to pace yourselves over the festive period. Have you got any recommendations for Christmas presents for writers? Please share! Should writers read, read, read? A participant on one of my recent writing workshops told us that she’d got stalled with the book she was working on, possibly because she had grown disheartened after reading several particularly wonderful books in the same genre. It made me think about the advice most authors give new writers, to learn from the best and read, read, read. I realised that although I do read a lot, it’s never in the same genre as I’m currently writing. When I was a new graduate working in a public library, I gorged myself on children’s fiction, catching up on all the books I’d missed as a non-reading child, but when I started writing children’s fiction in my late thirties, I moved away from reading children’s books and immersed myself in adults’ books about self-help and popular psychology. By the time I started writing self-help for children in my forties, I’d stopped reading it and moved on to books about spirituality, dreams and the creative process. Over the last few years, when I’ve been writing mostly about dreams and creativity, and working on my first dream-inspired fantasy fiction, my reading has been mostly memoir, and I have a few ideas for autobiographical writing firming up in the back of my mind at the moment, which I think may be my next big writing project. Of course, by the time I start to write any memoirs of my own, I’m sure I’ll be reading in some new genre altogether. I think I’ve always instinctively avoided reading the same kind of book as I’m writing, in order not to be influenced or discouraged by other people’s work. I’m inspired by it, but usually in the months and years before I decide to have a go myself. I’ve no idea what my longer-term future writing will be, but it occurs to me now that the clue will be in whatever I find myself reading while I’m working on these fiction and memoir ideas. This is how it works for me, and my first advice to would-be writers would not be read, read, read so much as write, write, write. Diaries, articles, poems, stories – write whatever you fancy writing. Write your way into your own voice. Read whatever you fancy reading too; don’t feel you have to stick to the same kind of thing as you want to write, because you never know where inspiration might come from. Enjoy other people’s writing, but take a break if it puts you off doing your own. When it comes to what I’m reading and writing at any given time, I prefer different genres. How about you? Have you read any great memoirs lately? As I mentioned a few months ago in my blog post When was the last time you felt really happy? I’ve been reading a lot about the craft of writing autobiography lately, and when I posted about this on my fb author page someone recommended Joy Harjo’s wonderful memoir. It’s beautifully written, short but perfectly formed, with the text divided into four sections named after the directions – East for sunrise and beginnings, North for difficult teachings, West for leaving and being left, and finding your way in the darkness, and South for release. I love the voice, so thoughtful and steeped in the spiritual traditions of Harjo’s ancestors, and the way the story begins with her journey towards being born, which gives her the opportunity to describe the lives of her parents before they became her parents. The story is embedded in its time and place in such a way that it evokes her whole social situation, bringing it alive even for readers like me, who may have known nothing at all about the Mvskoke/Creek Nation. I believe that if you do not answer the noise and urgency of your gifts, they will turn on you. Or drag you down with their immense sadness at being abandoned. I’ll be blogging about other great memoirs and books on memoir writing over the coming months, while I’m planning my workshop days on ‘Writing Your Life’ and pondering my own next autobiographical adventure.